With the release of Canadian banks’ second-quarter results, investors are beginning to measure the impact of the oil price collapse on the domestic financial industry. 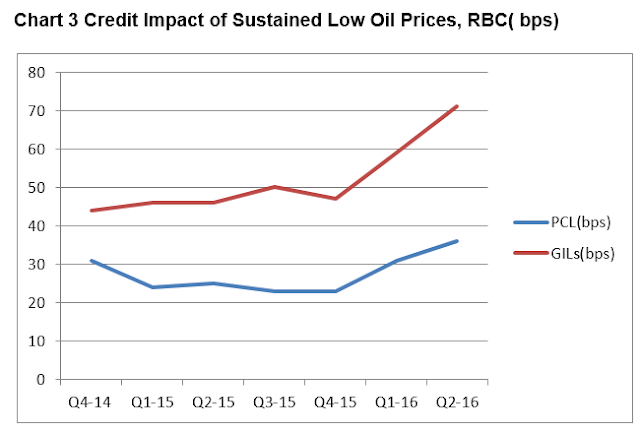 Widespread are the write-downs and other provisions the banks are taking in response to the weakened credit quality of many clients in the oil patch. This blog looks at this issue and its implications for future bank stock performance. On the whole, the Canadian banks turned in a profitable second quarter, although in some instances profits declined ( e.g. Scotiabank and BMO Montreal). The banking sector continues to show respectable results in its retail and consumer loan divisions. Also, their mortgage portfolio remains healthy, supported, to a great measure, by good loan-to-value measures and mortgage insurance. Finally, the banks’ capital ratios meet international standards as the they continue to improve in this area. Where the banks face the biggest challenge is with their loans to the energy and commodity sectors in Canada and the United States. Provisions for Loan Losses (PCL). 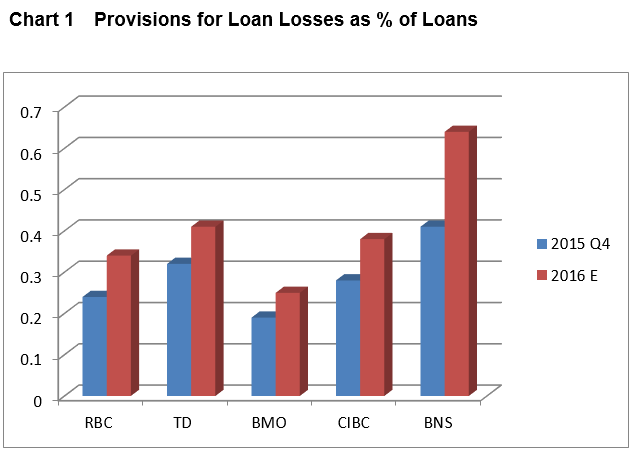 Chart 1 measures the loan losses for the major Canadian banks in terms of a percentage of the average loans outstanding. PCLs represent loans that have been written down for non-performance. There has been a dramatic increase since 2015 Q4 results as the slump in the oil prices take its toll. Gross Impairment of Loans (GILs). Another way to look at the impact of the oil sector is to examine the increase in GILs. GILs are loans that are non-performing loans that a bank will have to either write off or sell at a discount to a debt collector who will likely seize the collateral. Either way, bank profits will be negatively impacted. 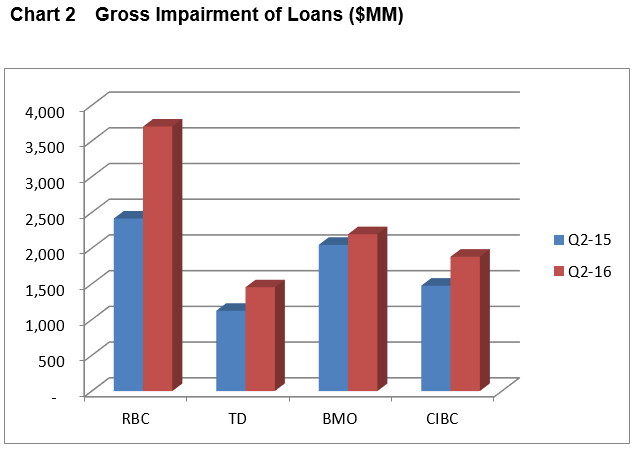 Chart 2 graphs the substantial increase over the past 12 months in GILs, especially Canada’s largest domestic bank, RBC. Chart 3 demonstrates the combined effects of both PCLs and GILs. 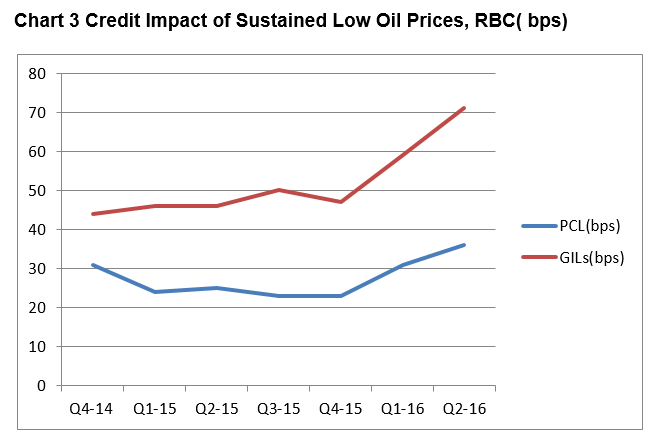 RBC attributes the increases in both ratios to the sustained low oil price environment. Furthermore, these ratios could well deteriorate further the longer oil prices remain around these levels. The banking industry is most exposed to the highest risk segment of the energy sector. 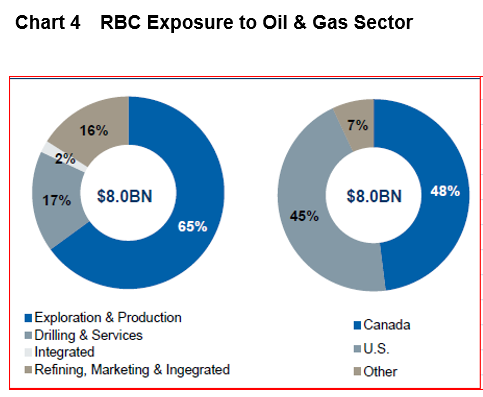 Fully 82 percent of RBCs energy sector loans go to exploration, production and drilling activities; loans to the integrated and refining segments remains relatively small. And, geographically, the bank’s exposure is roughly split evenly between Canada and the United States. 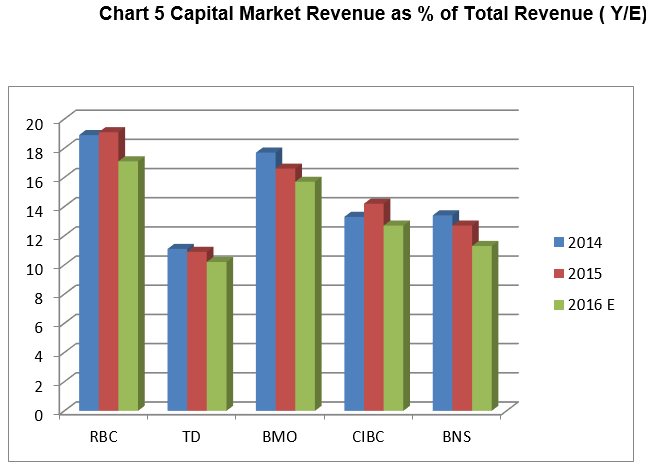 Capital Market Revenues(CMRs). CMRs are closely related to the commodity sector performance. The banks generate a significant proportion of total revenues from such activities as M&A, trading in equity and fixed incomes, IPOs, and advisory services, all of which have suffered declines over the past few years. ( Chart 5). Moreover, this segment of the industry has come under heavy regulatory scrutiny, adding to the cost of operations at a time when revenues are declining. Where CMRs used to generate between 15- 20 percent of total bank revenues, this activity now generates about between 11-16 percent, more importantly, the trend has been steadily declining as the industry grapples with a weak investment environment and rising costs. The Outlook. The Canadian banks continue to perform reasonably well as their core segments--- retail and mortgage markets--- hold up well. Nevertheless, they face considerable headwinds as Canada contends with weak oil and commodity prices and declining business investment. (http://soberlook.com/2016/06/the-decline-in-canadian-business_5.html). Recent surveys by Statistics Canada point to continued declines in additions to capital stock. The Bank of Canada anticipates that this erosion in business investment will contribute to a lower potential GDP growth and that , in turn, will impact future wage and profit growth--- both of which will be felt by the banks going forward.